Slap a zombie theme on anything these days and it's almost certain you'll have a breakout hit on your hands before you know it. The gamer nerds at Edmonton-based Fluik Entertainment have done just that with their latest free Office Zombie app which rocketed to number one in the iPhone App Store virtually overnight since arriving on September 21, 2011. Fluik cleverly reanimated their original chart topping iPhone game Office Jerk, to become a wildly zombified treat that allows players to poke out a zombie's eyeballs by tossing claw hammers, bricks or even dislodging a huge anvil to trigger an epic skull bashing. Sounds gory right? Not really. The Fluik gang have managed to create a perfect mix of violent amusement in a relatively bloodless environment, which makes Office Zombie ideal for the younger zombie-obsessed gamer geeks. In order to move forward in this game, a checklist of challenges must be completed. In-App purchases are offered to add weapons or you can choose to view a video advert so you can sample new weaponry for free. I found myself hooked after just minutes of hurling killer fish and using a gold vinyl record to instantly decapitate the snarky desk zombie who taunts by chanting "braaains" every so often. Office Zombie has great illustrations and plenty of room to evolve as long as developers continue to add creative items to hurl at the working dead and include the choice of buying new zombie characters in future updates. Although the graphics hold up well on iPad, I'm convinced a paid HD version for iPadders would be a big winner. There's also plenty of filthy luker to be earned by creating an In-App 'gore upgrade' for the endless throngs who love a good raging bloodbath. 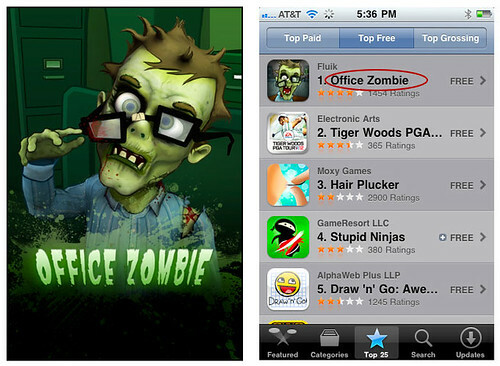 Office Zombie is a number one monster hit in the App Store for the right reason. It's friggin fun to play! It's that simple. Fluik Entertainment merged their collective brains and decided not to reinvent the wheel, they just zombified it with great skill. If you don't think that's a brilliant idea, then EAT ME! I mean that literally for all you walking dead iPhone gamer zombies out there. Mmmmm Braaains! How do you get thirsty no more? Dropping the anvil is simple James. When the anvil moves into place over the zombie flick hard and aim high with the hammer, axe, fish, steel trap, gold record. The drop will get you 3 points. It takes a few tries. Smashing the window in the door also takes a hard flick towards the right. Aim towards the door with the hammer or axe. It takes several tries but it will come easily once you get the hang of the hard flick off to the right. How do u anvil the zombie or break the door window? Behead the zombie using the gold record, the axe or exploding bear. It may take a few tries to slice him just right. the zombie must catch the bear to get beheaded. Trapped is the bear trap snapped onto his hands which also takes a few tries. Good luck beating Office Zombie Jray.